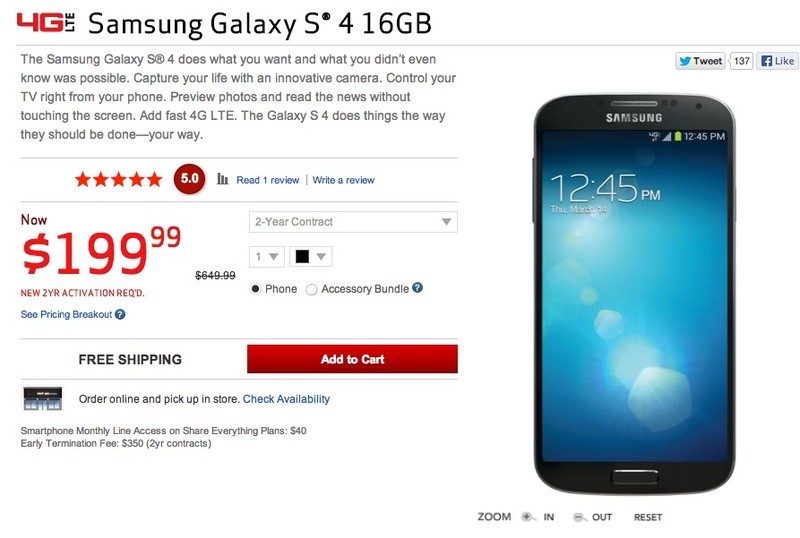 The Samsung Galaxy S4 is officially available from Verizon as of today both online and in stores. Almost a month after every other major carrier in the U.S. first placed this year’s flagship from Samsung on their store shelves, Big Red has joined in on the fun. For $199 and a new 2-year contract, the 16GB version can be yours in either white or black. Actually, the 16GB version is the only version Verizon is even selling, but keep in mind that the phone has a microSD card slot that supports 64GB cards, so you should have no issues with storage. In our Galaxy S4 review, we had very few negative things to say about it. The device is a solid jump from the Galaxy S3 with its 5″ FHD Super AMOLED display, quad-core Snapdragon 600 processor, and 13MP camera. It also runs the latest version of Android (4.2.2), something no other phone can currently say outside of a Nexus device from Google. The phone feels phenomenal in hand, at least in terms of size and bang for the buck. It may not be an all-aluminum “zero-gap” housing like on the HTC One, but that’s not necessarily a bad thing. If you ordered one or are stopping by a Verizon shop to pick one up, be sure to tell us your initial reactions in the comments.